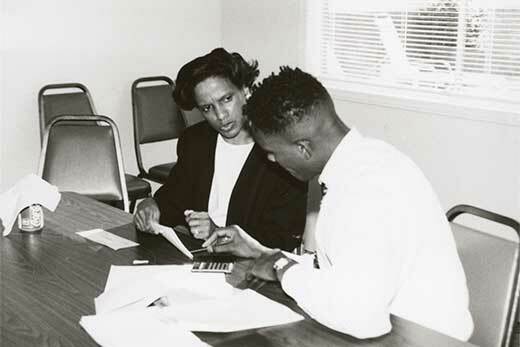 Staff members of SCLC/W.O.M.E.N.’s National AIDS Program are pictured in this circa 1990 photo. Credit: Southern Christian Leadership Conference records, Rose Library at Emory University. The records of the SCLC/Women's Organizational Movement for Equality Now, Inc. (SCLC/W.O.M.E.N.) are now open to researchers and the public at Emory University's Stuart A. Rose Manuscript, Archives and Rare Book Library. Evelyn G. Lowery founded SCLC/W.O.M.E.N. in her home in Atlanta in 1979. Originally part of the Southern Christian Leadership Conference (SCLC), the group encouraged women's participation and leadership in the organization. SCLC/ W.O.M.E.N. focused on serving the needs of women and families and developed programs in support of family values, education, wellness and human rights. In 1989, SCLC/ W.O.M.E.N. separated from SCLC, though the two organizations continued to work closely on numerous projects. SCLC/W.O.M.E.N. currently operates in the historic Auburn Avenue neighborhood of downtown Atlanta. “This collection will add immeasurably to the growing body of research on the role of women in the struggle for equality,” says Carol Anderson, professor of African American studies at Emory. The collection at the Rose Library primarily documents the activities and business of SCLC/W.O.M.E.N. from 1979-2013, with particular emphasis on the years 1985-1995. Materials include administrative files containing correspondence, memoranda, reports and meeting minutes; program files documenting the planning and execution of events and initiatives; and printed material such as fliers, posters, programs and brochures promoting the organization. 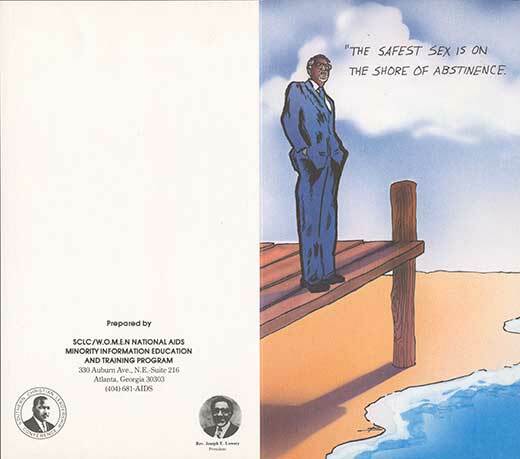 National AIDS Program greeting card featuring Reverend Joseph E. Lowery, undated. Credit: SCLC/W.O.M.E.N. Inc. records, Rose Library at Emory University. Funded by a grant from the Centers from Disease Control, the National AIDS Program was a multi-year effort that emphasized church and community involvement in the fight against HIV and AIDS. The program was managed from the national headquarters of SCLC/W.O.M.E.N. with six additional program sites across the country: Atlanta; Charlotte, North Carolina; Dayton, Ohio; Detroit, Michigan; Kansas City, Missouri; and Tuscaloosa, Alabama. The records of the program document meetings with community leaders and educational workshops that often included surveys to gauge community knowledge of the disease. The surveys offer an important window into contemporary popular conceptions about HIV and AIDS. SCLC/W.O.M.E.N. was involved in AIDS education and awareness as early as 1986 when the group hosted the first annual Conference on AIDS in the Black Community. These documents, along with the records of the National AIDS Program, highlight the early leadership of civil rights organizations, and specifically women, in efforts to educate America about the disease. In addition to innovative projects such as the National AIDS Program, SCLC/W.O.M.E.N. offered educational programs through the Family Life Learning Center and frequently led efforts to honor and promote civil rights activists. The Drum Major for Justice Award, first given in 1982, honors national and local community leaders for their achievements, while students on the Civil Rights Heritage Tour experience the history of the civil rights movement in the locations where events took place. The records may be accessed at the Rose Library Monday through Friday, from 9 a.m. to 5 p.m. To schedule a visit, contact rose.library@emory.edu.